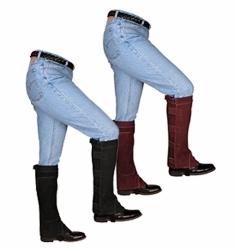 These quality-made suede half chaps provide a great fit from knee to ankle. Low profile hook and loop closures offer a great fit and adjustability. An elastic boot strap slips over instep to keep chaps in place.